Come out, bring your dog and enjoy the Off-Leash Dog Facility located in Lake Wichita Park. The address is 5205 Fairway at the Langford intersection. Separate spaces for large dogs and small dogs are provided. The idea is to offer owners a safe environment where they can release their dogs. 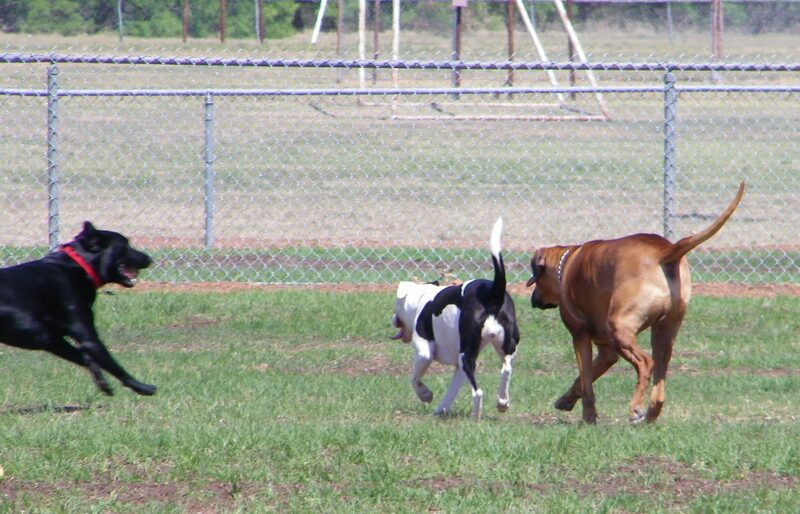 Wichita Falls ordinances related to the new off-leash dog facility contains a list of rules owners must follow when using the dog park. City leaders encourage people who plan to use the dog park to become familiar with these rules before using the facility. These rules are also posted outside the entrance to the facility. Sec. 92-253 - Hours of off-leash dog facility. 1. Closed from dusk to dawn and any time signs are posted closing the facility for cleaning or maintenance. 2. It shall be unlawful for anyone to loiter, idle, wander, stroll or play in the off-leash dog facility during such period when it is closed. However, if anyone applies for permission to carry out an activity in the off-leash dog facility during such hours, and the director of parks and recreation determines that such activity will not create a disturbance or public nuisance, the director shall have authority to issue a special permit for such activity. Sec. 82.254 - Use of off-leash dog facility generally. 1. Only dogs accompanied by an owner at least 16 years of age are permitted to be within the off-leash dog facility, whether or not the dog in question is leashed. An owner will only be considered to be accompanying a dog if both the person and the dog are within the fenced confines of the off-leash dog facility, and the dog is in the visible presence of the owner at all times. An owner may not accompany more than two dogs in the off-leash dog facility at any one time. Dogs must wear collars or harnesses bearing a current rabies vaccination tag and a city license tag at all times while in the off-leash dog facility. 2. It shall be unlawful for any person to bring a dog weighing 30 pounds or more into the designated "small dog area" of the off-leash dog facility. 3. It shall be unlawful for any person to bring a dog weighing less than 30 pounds into the designated "large dog area" of the off-leash dog facility. 4. It shall be unlawful for any person to host or participate in any competitive event at the off-leash dog facility unless the director of parks and recreation determines that such competitive event will not create a disturbance or public nuisance, and issues a special permit for such competitive event. 5. It shall be unlawful for any person to keep a dog leashed in the off-leash dog facility. Dog leashes must be removed within the double gate entry and dog released without the leash into the off leash pen. Only one owner at a time may utilize the double gate entry to leash and unleash a dog. Sec. 82-255 - Care of off-leash dog facility by users. owner to leave the off-leash dog facility without first cleaning up and disposing of all waste left by an accompanied dog. 2. Owners must stop any accompanied dog from digging and must fill any holes caused by an accompanied dog. It shall be unlawful for an owner to leave the off-leash dog facility without first filling any holes caused by an accompanied dog. Sec. 82.256 - Health rules for off-leash dog facility. 1. It shall be unlawful for any person to bring a dog which does not have current rabies vaccination into the off-leash dog facility. 2. It shall be unlawful for any person to bring a dog which has a contagious condition, disease, parasites, or fresh wounds into the off-leash dog facility. 3. It shall be unlawful for any person to bring a female dog in season into the off-leash dog facility, whether or not the female dog in question is leashed. Sec. 82-257- Bites, scratches and aggression in the off-leash dog facility. 1. All bites and scratches by a dog within the off-leash dog facility must be reported to the Animal Control Division of the Health District. It shall be unlawful for any person to fail to report to the Animal Control Division that a dog accompanied by him in the off-leash dog facility bit or scratched a person or another dog within twenty-four hours of the bite or scratch incident. 2. Dogs showing aggression toward people or other dogs must be removed immediately. It shall be unlawful for an owner to fail to move immediately to leash and remove from the off-leash dog facility any dog showing aggression. 3. It shall be unlawful for any person to bring any dog deemed to be vicious dog or a dangerous dog by any state or local government or agency into the off-leash dog facility. Sec. 82-258 - Use of off-leash dog facility by children. 1. No child under eight years of age is permitted in the off-leash dog facility except during city-approved activities scheduled for that age group. It shall be unlawful for a parent or guardian to permit a child under eight years of age to be in the off-leash dog facility, unless the child is attending a city-approved activity scheduled for that age group..
2. Every child over eight and under sixteen years of age in the off-leash dog facility must be accompanied by an adult over 17 years of age who is directly supervising the activities of that child. It shall be unlawful for a parent or guardian to permit a child over eight and under sixteen years of age to be in the off-leash dog facility unless the child is accompanied by an adult over 17 years of age who is directly supervising the activities of that child, or unless the child is attending a city-approved activity scheduled for that age group. Sec. 82-259 - Possession unlawful. 1. It shall be unlawful for any person to possess food for humans or dogs, including dog treats, tobacco products, alcoholic beverages or glass containers in the off-leash dog facility. 2. It shall be unlawful for any person to possess or unleash an animal other than a dog within the off-leash dog facility. 3. It shall be unlawful for any person to possess or utilize an outside obstacle in the off-leash dog facility. 4. It shall be unlawful for any person to possess a skateboard, skates, a bicycle, a scooter or any other wheeled apparatus in the off-leash dog facility. The operation of a non-motorized wheelchair or motorized mobility device by a person with physical disabilities is exempt from this section.